Tag line: "The world's masters of murder pull out all the stops to destroy Agent 007!" After the box-office success of Dr. No, it was a foregone conclusion that producers Harry Saltzman and Albert “Cubby” Broccoli would once again bring author Ian Fleming’s super spy James Bond, Agent 007, to the big screen. 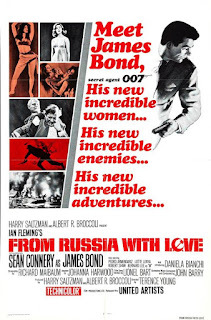 Working with a larger budget than they had before, the creative minds behind From Russia with Love, the second Bond offering, managed to up the ante on the first, making it bigger and more elaborate while, at the same time, continuing to tap into the near-flawless marriage of action and style that made Dr. No a worldwide phenomenon. The criminal organization SPECTRE is looking to obtain a Russian decoding device. To that end, two of their best operatives, Rosa Klebb (Lotte Lenya) and Kronsteen (Vladek Sheybal) devise a plan to lure Britain’s #1 spy, James Bond (Sean Connery) to Istanbul, wait for him to acquire the machine, and then kill him once he’s got it. Knowing his weakness for gorgeous women, SPECTRE sends an unsuspecting Russian beauty named Tatiana Romanova (Daniela Bianchi) to steer 007 in the right direction, but from the start, Bond is fully aware he’s walking into a trap. Aided by section chief Ali Kerim Bay (Pedro Armendáriz), Bond intends to turn the decoder over to MI6 instead, leading to a violent confrontation between him and Red Grant (Robert Shaw), SPECTRE’s top assassin. The action sequences this time around are, without a doubt, more spectacular than they were in Dr. No; aside from a well-staged gunfight at a Gypsy encampment and the thrilling chase towards the end of the movie, the showdown between 007 and Red Grant is one of the most exciting fights in Bond’s long history. From Russia with Love was also the film that introduced actor Desmond Llewelyn to the series, better known to Bond aficionados as ‘Q’ (here credited as Boothroyd, head of the ‘Q’ Branch), the HMSS operative who, for many years, provided the ultra-cool spy equipment that helped 007 get out of some tight spots. And while the gadgets and gizmos in From Russia with Love weren’t the most intricate (a briefcase equipped with a sniper rifle, ammunition, and a teargas canister), it was nice to see another familiar face join the ranks (Llewelyn would reprise the role of ‘Q’ sixteen more times before finally handing the reins to John Cleese in 2002’s Die Another Day). Along with the addition of new allies, this film also marked the initial appearance of Bond’s arch-nemesis, Ernst Blofeld (played here by Anthony Dawson), the SPECTRE mastermind who would next turn up in Thunderball. And even though 007 is decidedly more subdued than he was in Dr. No, Connery continues to shine in the part, striking the perfect balance between strength and refinement and further solidifying his position as the quintessential James Bond. 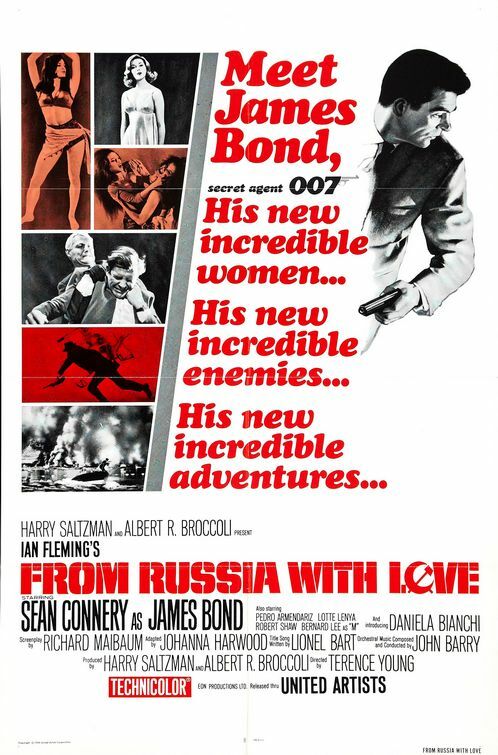 Yet another tradition was launched at the very end of From Russia with Love when, during the closing credits, it's revealed that “James Bond will return” in another cinematic adventure. And since it seemed to work well for the 007 franchise, I figured I’d borrow this little announcement for myself. So stay tuned: in the next few weeks, I’ll be moving on to 1964’s Goldfinger, which I consider the best movie in the series. My favorite Bond flick. One of the few early ones to stay fairly true to the book. @beep: It's definitely up there for me as well. A great movie! I believe this was John F. Kennedy's favorite movie. I'm really enjoying your posts. Keep up the good work! I'd put this Bond flick at the top of them all, with Goldfinger second and On Her Majesty's Secret Service third (despite the one-time appearance of George Lazenby who, in my opinion, made a great James Bond.) FRWL didn't rely on the high-tech gadgets prominent in subsequent additions of the series and focused instead on the actual conflict.